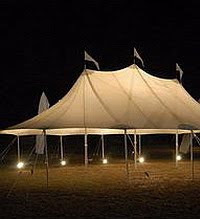 Just a quick note to keep an eye out for Stamford Tent's new Sailcloth style tent. Inspired by the sea, it's a slightly different style with an organic, slightly translucent look & feel from the sailcloth fabric. With elegant sculptured peaks and custom nautical center and side poles, this is a wonderful option especially here in New England. We will have several sizes to choose from this summer! !